The fresh summer breeze, growing waves, and steep, fast-breaking edge make it tough to stay on the fish. Only careful manipulation of the trolling motor keeps us midway up the edge, plunging from 12 feet down to 30, where the walleye are thick and aggressive. This is the sort of fishing my wife likes and I’m delighted to see a bend in Francine’s rod and a smile on her face. Once again White Lake delivers. We’re at the north end, where the 20-plus-kilometre-long lake blossoms into a series of expansive bays. Like an hourglass, it tapers down then widens again to the south, with the Trans-Canada Highway crossing at its narrows. Not only is White Lake easily accessible from the highway, but at the south end of the lake, a full service provincial campground furnishes convenient accommodation for anglers amongst sand beaches, fragrant pines, and wild roses. It’s early afternoon and it’s difficult to pull ourselves away from walleye up to 24 inches, but we head south to the campground to rendezvous with my long-time angling companion and Ontario OUT OF DOORS Senior Editor Gord Ellis and his wife Cheryl. 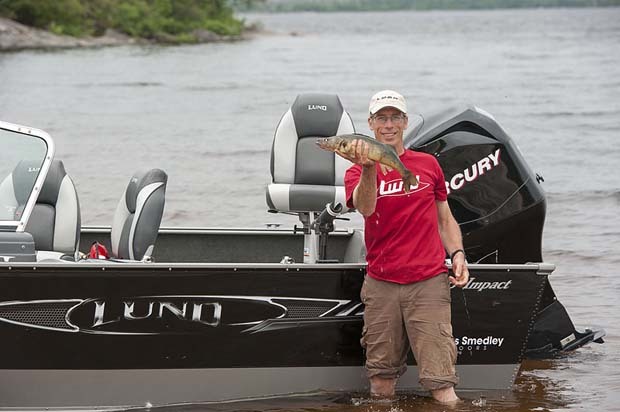 As part of Ontario Family Fishing Events week, Gord is scheduled to give a walleye seminar. I’m in the fish cleaning shack wielding my fillet knife when he arrives and backs his big Lund boat onto the lawn in front of a collection of picnic tables and benches at the day-use area. I finish bagging fillets for dinner just in time for Gord’s seminar, and even make a cameo appearance, helping to demonstrate the virtues of slip sinker rigs and slip floats. 2013 marks the 50th anniversary of White Lake Provincial Park and the milestone has us looking back. With its playground, great campsites, sand beaches, and good fishing, White Lake has always been a popular destination for my family and the Ellis clan. My two girls were newborns the first time they visited the park and Gord’s boys were not much older. TRANSPORTATION: Drive-to launch at campground or at narrows near Highway 17 bridge. 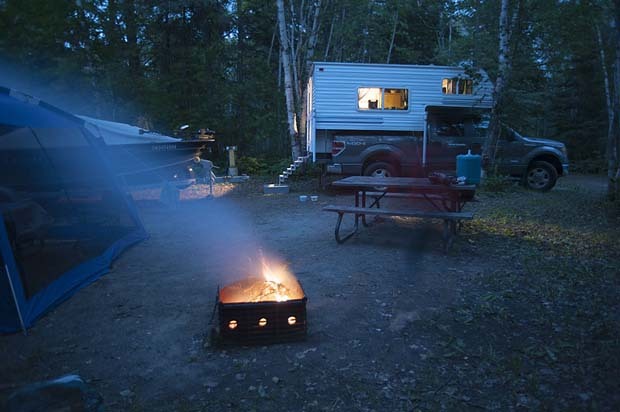 ACCOMMODATIONS: White Lake Provincial Park Campground has 187 sites, 60 with electrical service. Facilities include comfort station with showers, a laundromat, boat launch, fish cleaning house, playground, beach and amphitheatre. Fees are consistent with Ontario Provincial Park rates. Another thing that has changed is the fishing. Although it’s always been good, it’s now much better than it was when we first visited the park in the early 90s. The combination of a restrictive slot size regulation implemented in the mid-90s, the present 4-fish limit, and the growing inclination towards catch and release seem to have improved the fishing in many Northeastern Ontario lakes. Back at our campsite we pool our resources for a dinner of fresh walleye, chicken, and salad. It’s a warm July evening and with several hours of daylight left we launch the boats and head south where the lake tapers down to a meandering stretch of bays and narrows, eventually spilling into the rapids and pools of the White River. We only get as far as the railway bridge, where Francine and I connect quickly trolling crawlers and spinner rigs, while Gord and Cheryl drop jigs amidst a pod of walleye. 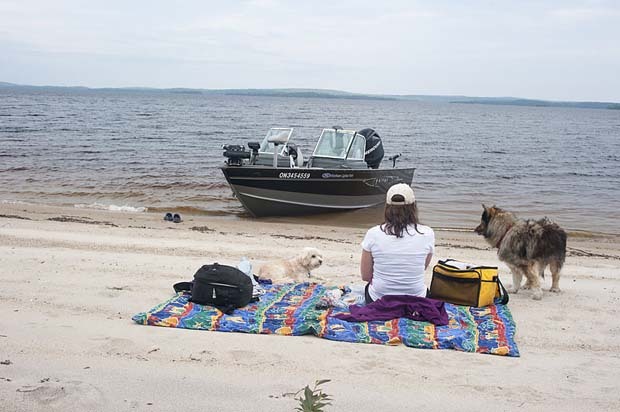 We’re only a 5-minute ride from the campground and the sheltered and productive waters of the southern section remind me why White Lake Provincial Park is such a great family fishing destination. It’s not a bad couples retreat either. Francine and I return north to run a stretch of wooded shoreline and come across a protruding shallows loaded with walleye. Cheryl and Gord join us for a last flurry of activity before heading back to the campsite. Guitar playing, a crackling fire, and conversation merge with the starry night. It’s 9 a.m. by the time we launch next morning and there’s already a breeze rustling the aspen leaves. We head north, under the Hwy 17 bridge, through the narrows and onto the broad expanse of White Lake’s top end. The sharp chop of the narrows builds into a rolling swell. White Lake is about 8 kilometres at its widest, with a well-deserved reputation for rough water. “Remember we used to come up here with the old 20-hp Merc on the 14-foot aluminium?” I ask Francine as spray pelts the windshield of our 18-foot Lund. I throttle back amongst rolling swells at a mid-lake waypoint, with Gord and Cheryl following suit. “This is the sharp edge Francine and I fished yesterday,” I call out over the wind. “Looks like the fish are still here,” I say, glancing at the sonar. Francine and I lower bottom bouncers and drag leeches through great clusters of walleye holding at around 24 feet. We hook a few small walleye but the action is decidedly slower than yesterday. On the Ellis craft it’s a different story. Ever attuned to the whims of the walleye, Gord marks a stack of fish along the sharp break and he and Cheryl rig up with jigs and hover overtop. Gord’s rod is perpetually bent and we watch the cagey Cheryl catch and release a few fat 20-inchers as we troll slowly past. Following my friend’s example I continue trolling until I mark another group of walleye, then hit the Spot Lock button on the Minn Kota trolling motor. This is a great application for the Spot Lock feature which uses GPS to keep us over the spot. Francine drops a jig and I toss out a slip float and we’re both rewarded immediately. The action is steady for the next hour but with the growing wind and waves I suggest a move to a sheltered shore along one of the northern bays. After a thumbs-up from Gord we ride the whitecapped waters into the sheltered calm of a western shoreline. Even with the onset of intermittent rain it’s much more pleasant fishing tranquil waters than in the teeth of the wind. 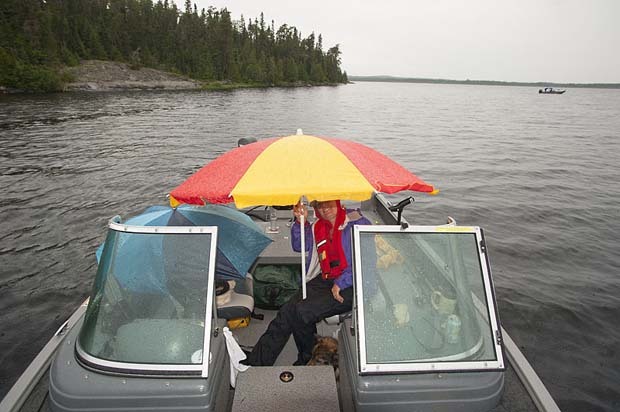 Although the action is a little slower the ladies alternately relax under umbrellas and bolt upright to reel in the occasional walleye that pulls on their crawler harness. Clad in raingear, I work the trolling motor from the bow, enjoy the light rain and watch as Gord does the same. Sadly we have to head home today but, like me, I’m pretty sure Gord is already daydreaming about our next trip to White Lake – a destination that has become an old and reliable friend. This article first appeared in the 2014 Ontario OUT OF DOORS Fishing Annual. Subscribe.